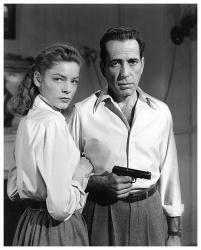 This is a brand new, licensed, 18" X 22" poster print of Lauren Bacall and Humphrey Bogart from the 1948 John Huston classic Key Largo. The print has a 1" white border surrounding the image. The print was published on a sturdy paper stock by Image Conscious.